An extra air of truth was lent to Denial, a film about proving the truth, by shooting in the real law office the story’s set around, in Camden’s Red Lion Square. Mishcon de Reya was based there in Summit House, when it took on the libel case against historian Deborah Lipstadt, forcing her to prove the truth of the Holocaust. She was accused of libel by David Irving, after calling him a dangerous spokesperson for Holocaust denial. Rachel Weisz and Timothy Spall star in a script by Sir David Hare, showing how the case was won resoundingly, with Irving called an anti-semite and a racist by the judge. The film opens on January 27th. Here’s the trailer. James Libson and Anthony Julius, who represented Dr Lipstadt, are still at Mishcon, where they were able to watch themselves being played in the same office they worked out of at the time. James Libson has said, “Attending the shoot and watching [Jack] Lowden play me in our offices, re-created, with incredible accuracy, to their 1998 state, was a time-travel moment. It was strange in a way I did not expect. It was like a false memory. I was watching something I knew to be a fictionalised version of my own life, but the surroundings made it feel like a documentary. “Six months later I watched a cut of the actual movie with some trepidation… It felt very faithful to the case. “I watched it with the three leading lawyers: my colleague Anthony Julius; Richard Rampton, lead advocate or Queen’s Counsel, and his “junior,” Heather Rogers. It was like a reunion, and unexpectedly stirred our emotions. Mishcon de Reya’s Director of Premises and Facilities Management, Melvyn Hale, worked closely with the filmmakers to make the location available. He says, “Enabling the film crew to use our building felt a real privilege, as it reflected both our involvement in the production and the fact we work in an architecturally interesting building on a daily basis. “The crews were very respectful of our daily operations and fully cooperated with the security measures we required to protect our business operations. The production made a generous donation by way of thanks to local residents in the square. Chair of the Red Lion Square Tenants and Residents Association Patricia Wager has thanked the filmmakers, saying residents were invited to watch, and that disruption was minimal. She added that donations such as this go toward improvements for the tenants hall, and are shared with Friends of Red Lion Square Garden to help maintain it. Important scenes were also filmed at the JW3 cultural centre, doubling as an American auditorium, where we see Rachel Weisz giving a speech to an audience, and a rebuttal, on the subject of holocaust denial. 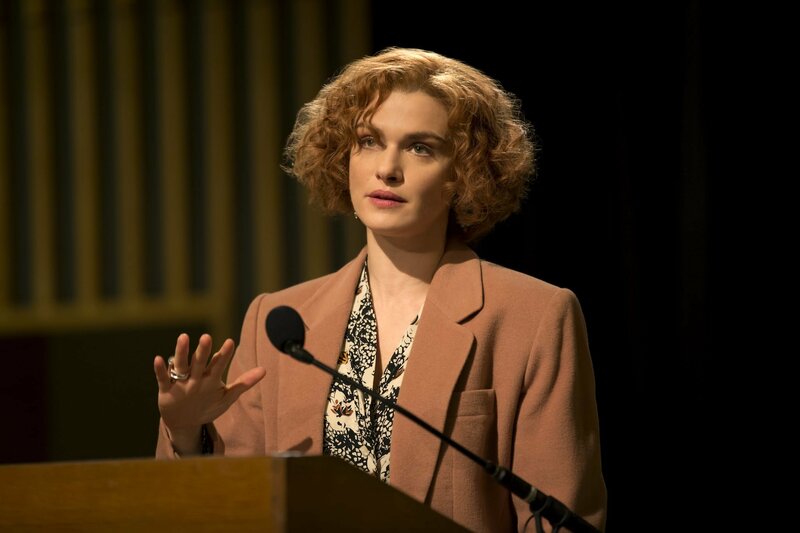 JW3’s CEO, Raymond Simonson says, “When we were approached by the location team scout and told that the film they were about to start making was the true story of Professor Deborah Lipstadt’s victory over the Holocaust denier David Irving, we immediately said yes. “Having followed the whole trial keenly at the time, and become a huge admirer of Deborah, I felt a personal connection to the story. And as a Jewish community centre where we are actively engaging with Holocaust survivors every week, we felt it would be an honour to be associated with such an important film. “The whole production team were a real pleasure to work with. They were very sensitive to the fact that even whilst they were filming, we still had to run a busy venue with over 4,500 visitors during the week. They were respectful of our space and towards our staff, and we were never an inconvenience. Fitzroy Square in Camden was also used. The courtroom scenes were filmed at Kingston’s Surrey County Hall. And in some interiors were filmed in Bermondsey Street in Southwark.